Shawe is a senior officer of the crew Damage Incorporated, and prince of the flag No Leaf Clover. Shawe's home is Dragon's Nest on the Viridian Ocean but he plays on all of the doubloon oceans. Shawe is the creator and owner of the "FIGHT CLUB!" 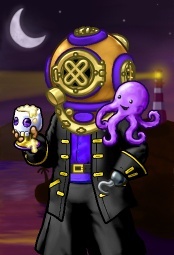 Avatar Shoppe on the forums which can be found here. His pirate birthday is Wednesday September 5, 2007. He has two familiars: a purple octopus named Greed, and a black on blue serpent named Vicious. His favorite duty puzzle is Foraging. His favorite parlor game is Drinking. This page was last modified on 23 February 2012, at 03:53.